What does an animation teacher do for fun? He spends two years (on and off) making a short film as part of a web series. Its November and over two years ago, we posted our first Watchcat episode and added our Watchcat Films channel on Youtube. 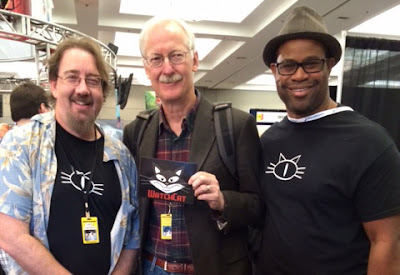 John Musker, one of the directors of the latest Disney film, "Mohana"
After CTNX, we were inspired to finish what we had started and even made this Christmas video card promoting the next WatchCat Episode. Time flies, we have tried to find an audience by posting this weekly blog to show our production process. We also attempted a few Live "Blogcasts", which might not have turned out as well as we had hoped, but we learned alot. Its hard to make an animated film with limited free time and resources, but I learned a lot from this project and how I can improve on the next. We tried to educated you in the animation process and keep you entertained every Watchcat Wednesday along the way. We appreciate all the comments we have received and are amazed that our blog has reached the following countries all over the world. Besides the United States at 6639, we had all time viewers of our cat cartoon reach the following viewing numbers! And so, check out the Watchcat Files next Watchcat Wednesday, Nov 16th 2016 to see Watchcat Episode 2. If you are going to the Burbank CTN Expo this weekend, looking us walking around in our Watchcat T-shirt. Say hello and get a free Watchcat postcard!